Lana tries to close down Briarcliff while Johnny attempts to finish his father's work on the season finale of American Horror Story: Asylum. A new inmate causes problems this week for Sister Jude. Grace's alien obsession, meanwhile, grows violent. 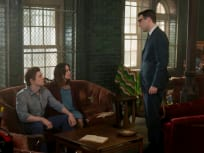 Monsignor Howard tries to silence Sister June while an unexpected visitor shows up for Dr Thredson on American Horror Story: Asylum. 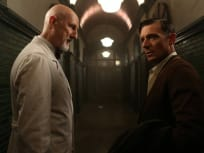 On American Horror Story: Asylum, Dr. Thredson sets up a reunion with Kit while Monsignor Howard has a confrontation with the devil. On American Horror Story: Asylum, has Lana found evidence that can free Kit? On American Horror Story: Asylum, Arden has an unexpected encounter and someone dressed as Santa Clause causes trouble at Briarcliff. Kit tries to reunite with Grace while Sister Mary Eunice believes there's an evil presence at Briarcliff on American Horror Story: Asylum. On American Horror Story: Asylum, Bloody Face's past is finally revealed and a young girl is left at Briarcliff. "I am Anne Frank, Pt. 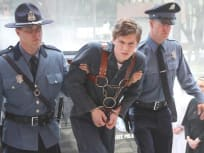 2"
Bloody face is finally revealed while Kit confesses and Sister Jude makes a discovery about Arden on American Horror Story: Asylum. "I Am Anne Frank, Pt. 1"
We meet a new patient on this episode of American Horror Story, while Jude has more suspicions about Dr. Arden. 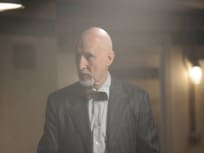 During a violent storm and group of patients attempt an escape on American Horror Story. The staff summons an exorcist on the second episode of American Horror Story Asylum. Would you expect anything less? American Horror Story is back! With a new tale and a new cast of characters! Permalink: Are you ready for me? Yes. I'm free. Nutmeg makes all the difference in the world. Permalink: Nutmeg makes all the difference in the world. American Horror Story Review: Happily Ever After? American Horror Story Review: Is a Happy Ending Possible?